For the fifth-straight season the Seahawks posted a winning record, despite key injuries throughout the year on an under-performing defense and an offensive line which had Russell Wilson running for his life much of the time. A midseason blockbuster brought in Duane Brown at left tackle and it sparked some improvements, yet in the end it was too little too late, and the team had too many fatal flaws to overcome, which led to the team missing the playoffs for the first time since 2011. The road to a division crown looks to be no easy task for the foreseeable future, as the Rams and 49ers have promising young head coach-quarterback tandems in place. The Legion of Boom is another year older and it’s no sure thing the band stays together even for this season with contract holdouts and trade rumors swirling. There are still some excellent pieces to build around on both sides of the ball, such as Wilson and Bobby Wagner, as well as exciting young players like Shaquill Griffin and Frank Clark. Major changes to the coaching staff for 2018 include Brian Schottenheimer’s arrival to replace Darrell Bevell at offensive coordinator, and Ken Norton Jr. to replace Kris Richard as defensive coordinator, and Pete Carroll has vowed to do everything in his power to get this team back to competing at an elite level. 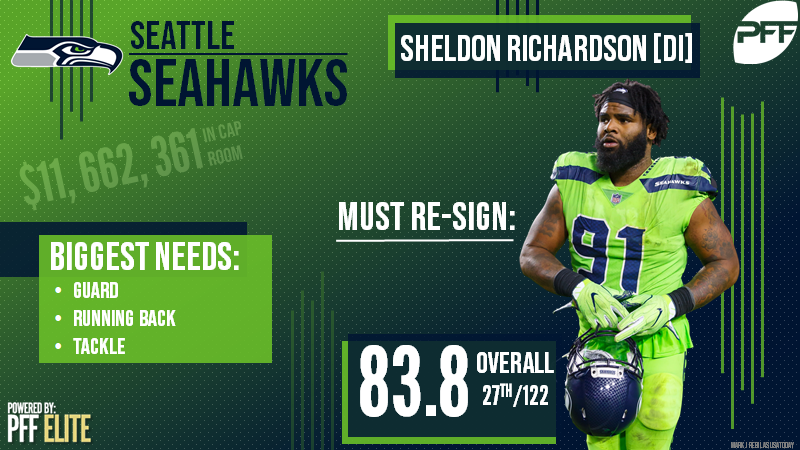 Richardson arrived in Seattle in a swap for Jermaine Kearse and a late-round pick exchange, and a change of scenery proved fruitful, as he provided an interior pass-rush presence. He created pressure on opposing quarterbacks 36 times, the third-highest amount on the team behind only Frank Clark and Michael Bennett. Richardson’s production was well balanced, as he also provided 22 stops along with zero missed tackles in the run game. The Seahawks have a couple solid young players defensive tackles in Jarran Reed and Nazair Jones, but neither can bring the type pass-rush, versatility, and disruption that Richardson can. Pass-rush is an area the Seahawks were lackluster at times in 2017, and bringing Richardson back would go a long way to solidifying the front and giving them a chance to improve in that area, rather than regress. The two areas which have the most room for improvement are the run game and pass protection. Signing Andrew Norwell, the top free agent guard, would help shore up those two areas immediately. Norwell had the highest pass-blocking grade of any guard in the NFL in 2017, and was the third-highest overall. Too often Russell Wilson was seen scrambling for his life only to pull a rabbit out of a hat in order to create production for this offense. The Luke Joeckel experiment was a failed one, and while there is still hope for Ethan Pocic, he struggled greatly as a rookie. In addition to showing Wilson an effort to protect him (to help keep him from being lured away by the Yankees), the signing of Norwell would help stabilize an offensive line which allowed pressure 209 times on 653 passing plays in 2017, for a pass-block efficiency of 75.3, 29th in the NFL. Germain Ifedi allowed 52 pressures last season, the fourth-most pressures allowed by an offensive tackle in the NFL. He was also called for 19 penalties, the most in the NFL. Fleming, who played 543 snaps in 2017 and finished with an 80.2 pass-blocking grade, would provide an upgrade. Fleming has registered 298 snaps at left tackle and 878 snaps at right tackle since 2015 and has shown the versatility to play both sides effectively when called upon, which would give the Seahawks flexibility for the future as Duane Brown is 32 years old and will be a free agent in 2019. Isaiah Crowell had a down year in 2017, but so did most of the Browns, and he should be an affordable option to bring in at a needed position to compete for a starting job. Eddie Lacy was ineffective, as was Thomas Rawls, who was coming off injury. Chris Carson showed promise and actually earned the starting job as seventh-round rookie, but he suffered a season ending injury. Mike Davis finished the season as the starter and showed promise as well, but the Seahawks should be looking to at least bring in competition and hopefully be an upgrade to an area in which they struggled to generate production. 2017 was a down year in terms of production for Crowell, but in 2016 he ran for 3.30 yards after contact per carry, which was the second-best mark of all running backs (min. 102 carries). Running back in general should be a relatively inexpensive position to address via free agency, and coming off of a down year, Crowell could turn out to be a bargain if he can regain his 2016 form.